It’s hard to believe that Tripwire Interactive has been working on Killing Floor for over a decade and the properly numbered sequel is only just now getting into the hands of gamers, at last. This gore-filled first person shooter franchise evolved as an Unreal Tournament ’04 mod before turning into its own standalone experience. Now, Killing Floor 2 is finally making its first steps out of Steam Early Access with a simultaneous launch on PlayStation 4 (Pro Enhanced) and PC, taking advantage of the added power of both platforms. While having the unfortunate circumstance of releasing right alongside some of the Fall’s biggest shooters, Killing Floor 2’s final release still stands strong as an experience all its own. The wave-based gameplay of the first Killing Floor title returns with all of its splendor and gore, bringing the mayhem across a dozen different maps. Depending on the perk chosen, players are given a different loadout to start. From there, it’s up to either finding weapons scattered throughout the level or spending hard-earned dosh at the trader that pops up between rounds. As long as the player is doing enough to help out the team, whether it’s healing or just providing the heavy firepower, they’ll usually earn enough cash to pick up heavier ordnance and all-important body armor. With a full squad of six players, it isn’t uncommon for waves to include one or two hundred Zeds to put back down into the ground. At the end of every level (four, seven, or ten waves depending on length) there’s a climactic boss fight against one of two elite Zeds. This is where the teamwork truly shines, with the boss fight requiring each character to hold their own and use their given abilities to survive. Trying to survive a fight against Dr. Hans Volter without anyone that can offer some team healing is only a recipe for defeat. Every level in Killing Floor 2 can be completed in solo play, but without the banter and firepower support of other players, the horde mode just doesn’t feel nearly as addictive. Regardless of what perk you choose to play, there’s enough flexibility in team composition that the usual staples of party combat are handy, though not essential when playing on lower difficulties. Having someone that can assist with healing can be the sole thing that keeps a group from falling apart during the final wave of combat. The Field Medic is the obvious choice for keeping everyone topped off, although other perks can fill that role. Every character has access to tools like the HMTech class of weapons that can fire a healing dart at teammates, although they might not be as efficient depending on how their class skills are setup. The newly added Survivalist class helps to bridge that gap with a ‘jack-of-all-trades’ approach that includes options for healing grenades that would otherwise be limited solely to the Field Medic. Picking a perk that matches your weapon preference will expedite the leveling up process, making your character more useful in future matches. 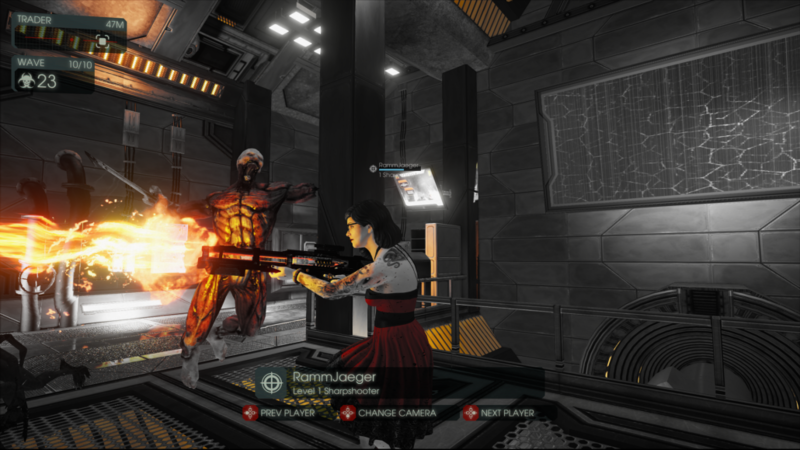 Killing Floor 2’s persistent progress rewards the player for most any task they perform, from welding doors to healing teammates and even targeting certain enemy types with a particular class of weapon. Even in matches where I failed to make it close to the final boss encounter, I always felt rewarded with just a bit more progress towards leveling up my chosen class (although finishing a challenging level certainly was a great feeling). Killing Floor 2’s cheap price ($39.99 in the US for a physical copy) does feature a number of cosmetic microtransactions, although we were reassured that whatever is to come would purely be visual upgrades and have no bearing on the gameplay. 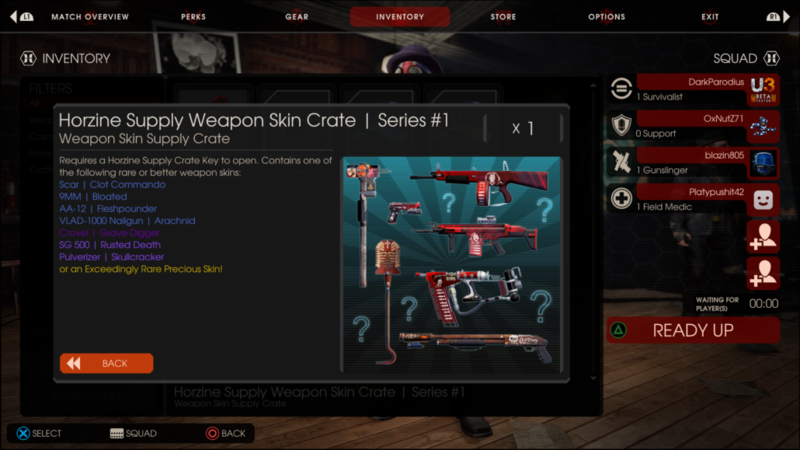 Between five different levels, I had earned a single weapon skin (for the double-barreled shotgun, a staple in my late-game arsenal) as well as a Horzine-themed weapon crate. Those familiar with the Valve Marketplace can instantly recognize the setup, even with matching color coding for rarity. While the crates themselves are free drops after a game, the keys to unlock them are exclusive to the in-game cash shop. Right out of the gate, Killing Floor 2 offers a number of accessories and costumes for each of the playable characters. Even so, the prospect of wielding a bright pink gas mask into battle is too important to ignore. Once the in-game shop goes live, I’ll happily throw the developers at Tripwire a few dollars to unlock the crates I’ve earned. A gratuitous (and extremely detailed) use of gore in Killing Floor 2 isn’t just for the shock factor but is actually well incorporated into the actual gameplay. Being stylish in combat by engaging in parrying and other melee attacks or even the rudimentary act of lining up headshots can occasionally invoke the use of what Tripwire calls ‘Zed Time’. This brings the frantic action down to a standstill, giving a much-needed diversion to run off and pop a heal or dole out another flurry of headshots. Just about everything is instantly satisfying when these key slowdown moments happen in a multiplayer match, save for those unfortunate times when you’re right in the midst of reloading. 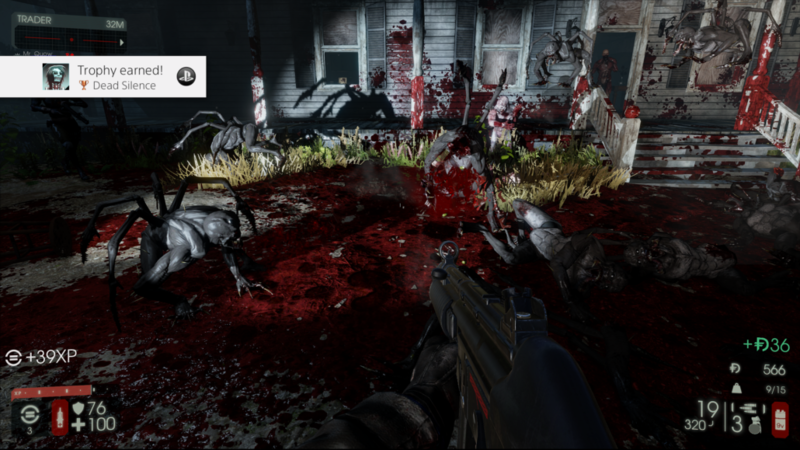 That same focus on gore is what makes Killing Floor 2 so damn impressive on the PlayStation 4 Pro. As reported earlier, Tripwire Interactive made sure that owners of 4K displays will play the game at 1800P (3200×1800) native resolution with checkerboard rendering and subsequent upscaling to 4K. Being stuck with a FullHD TV myself, I was still able to enjoy the remaining enhancements. While playing on PlayStation 4 Pro, Killing Floor 2’s textures are boosted to Ultra settings and at 1080P there’s also super-sampling which provides a very clean image. Performance is also great, it never dipped below a rock-solid 60FPS even in the most hectic of firefights (complete with grenade barrages from both sides). If you want to see the attention to detail with how visceral Killing Floor 2’s combat get, invest in a katana from the vendor and become the Highlander. As a cooperative experience, Killing Floor 2 makes no attempts to hide what it truly is: a Horde Mode with persistent progression. A special Versus mode adds a second option to pit players against one another with one side taking control of the enemy Zeds but I didn’t have the opportunity to find a single match during my review. In my few days of being able to experience the Playstation 4 Pro version for myself, I still have the craving to keep coming back for one more Survival match anytime I get home from work. Surviving the Specimen onslaught won’t be easy to handle on your own, so if you’re looking to get the most out of Killing Floor 2, you’re might want to bring some friends.